2018 was a good ride, wasn’t it? Almost 22 days into 2019, you must have a huge list of resolutions. You might have followed some of them, and ignored most of them. That’s usually the destiny of resolutions. As much as we encourage people to have a set of resolutions and fulfill them, it just never happens. So, as on organization who love riders, and people who love bikes, we are presenting a set of rider-goals, if we may, for all the bike-loving people out there. It’s a simple, tight and an adventurous set of goals that is going to give your year a touch of magic. Have you ever heard the phrase ‘More is always better?’ We couldn’t agree more with this phrase in 2019. Your office deadlines, your third cousin’s engagement party, your friend’s children’s birthday party, whatever stopped you to getting on your bike and riding into the sunset, you are going to make it up this year. Make sure that when you are sitting in a near year’s eve party of December 2019, you have a hell lot of stories. Stories about how you went out camping in Kasol and in the middle of the night your bike broke down and how you had to use the bare minimum tools, figure it out, and then when it was finally done, you finally drove into the sunrise. Don’t you want your 2019 to be filled with such thrilling stories? Of course, bearing in mind your safety, don’t you want to do something toofani this year? So, tear off those excuses, rent a bike in Bangalore and explore those places you were planning to! Riders are always pinned to be rash, aggressive, and spontaneous. The only good thing out of the above-mentioned three things is the spontaneity part. Rides which are planned in a hasty moment are always the best ones, but that doesn’t allow anyone to not check their safety gear. As you enter 2019, don’t forget to invest smartly in safety gear for your bike. From a sturdy helmet to friction gloves, you need all the gear in your backpack to have a safe, fun and memorable experience! 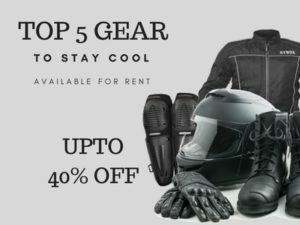 For your next trip, ensure when you are renting out your bike in Bangalore, you also pick up the required safety gear. 3. Ride in a pack! What is a rider without its wolf pack? These group of friends have grown up with the same obsession as yours. 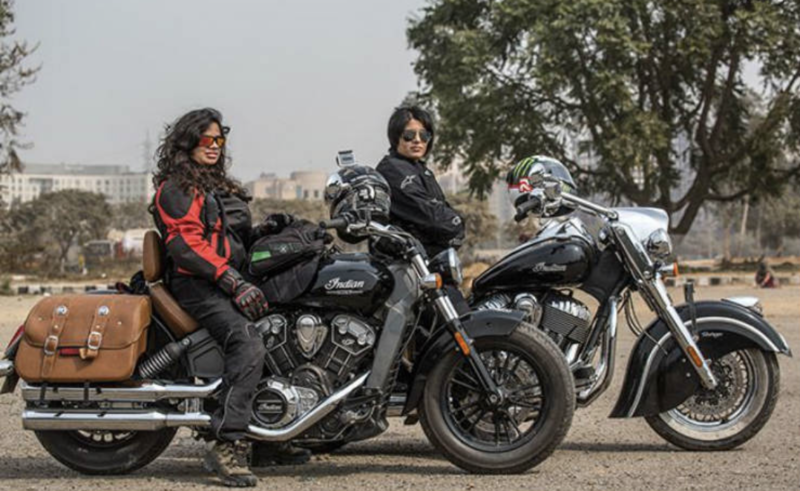 They’ve had bike posters on their bedroom walls, they would get energized by the thrust of the gear and all you have to do is say the word and they are all set for the road trip. Life must have taken you all on different paths, but you can ride on the same one, once again with a road trip. So, call your pack, make a plan, create Whatsapp group! Do whatever it takes to ride with your pack one more time. 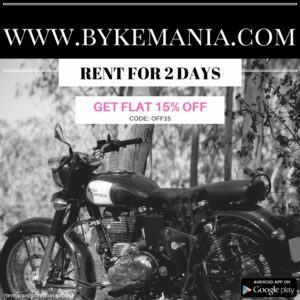 Pretty sure, a few might have to get their bikes repaired, make it simpler for them and recommend a Bangalore rental place like bykemania to them to pick up a bike. 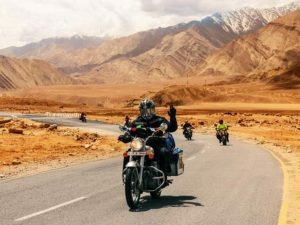 As much as it is fun to ride in a pack, it’s a completely different experience to do a road trip solo. No matter how cliche it might sound, when you ride at speed with wind blowing on your face and just your thoughts, it’s a different feeling. If you haven’t done that yet, 2019 is the year! Riding solo is a must on your list of goals. 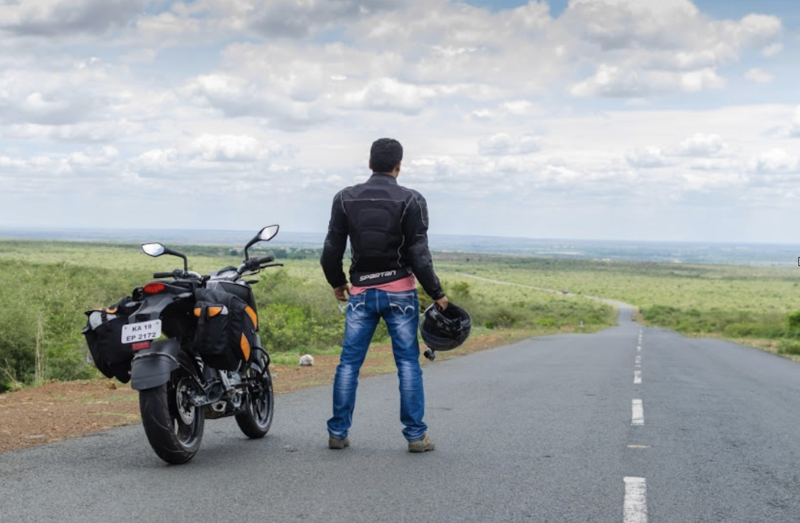 If you renting your bike from Bangalore, ensure you tell your bike rental place the same, as they will be extra careful while renting you a bike. 5. Go off the grid! 2019 is going to be about the latest technology and what not! It’s your chance to go against the wave. Take the road, less traveled, figuratively and metaphorically speaking. What if you went on a ride without any technological help? Depend on your analog watch, read maps and asked people for directions and stay completely off the grid? Sound like something that you’d be interested in? Go for it! However, the not-using-technology would mean that you have to do extra research about the place, always be alert and stay ready for whatever the experience throws at you. It’s time to make 2019 your year. Fill with stories and experiences that would leave everyone surprised. Go for it people, your list of goals awaits you!